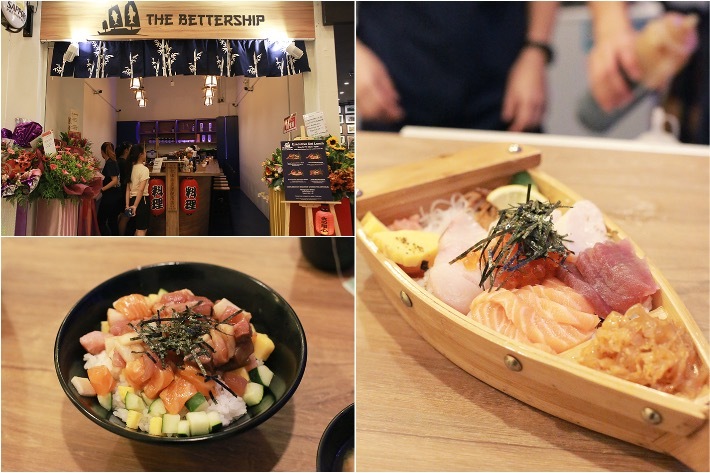 The Bettership adopts a rather simple hole-in-the-wall concept with an open kitchen where diners can watch as their food gets prepared. Sticking true to its name, you will also notice that the shape of the dining counter is shaped like the front of a ship. Their menu is pretty straightforward, either you pick from their wide selection of donburi potions or simply go for their variety of sashimi options that can be served in the form of a Basic Don, Premium Don, or in the classic Sashimi Setting. Served in a tiny wooden ship-like bowl, the Chirashi Don (S$17.90) comprises diced salmon, tuna, tamago, cucumber and a variety of other fishes—all of which were laid out neatly atop a bed of tasty Japanese rice. As with any good chirashi don, the ingredients were fresh, chunky and plentiful, allowing the unique flavour and textural qualities of each individual item to shine through. The addition of nori, although intended as more of a garnish, provided a lovely umami note to the dish which bolded well with the robust fishy flavours. An alternative to consider should you wish to enjoy sashimi at its textural best is the Kaisen Don (S$17.90) which is served in a sashimi boat. This dish features thick slices of salmon, maguro (tuna), hamachi (yellowtail), swordfish, scallop and is accompanied by tamago, radish, jellyfish, inari (beancurd) skin, and ginger slices. Overall, we were very impressed by the quality of food here and the sheer hospitality of the staff also helped make our lunch a very pleasant one.